Having an entrepreneurial mindset can be the difference between success and failure as an aspiring entrepreneur. It is important to know why and how you can develop this mindset, and I will teach you just that. Using unique exercises and tools developed by both myself and others, by the end you’ll be able to develop an entrepreneurial mindset. Having an entrepreneurial mindset is very important for a number of reasons. First, this mindset has the ability to make you perform at higher levels, thus achieving more. Secondly, it will allow you to develop your business ideas to the fullest. With this mindset in the business idea phase, you will have a better chance at succeeding at finding the right idea. It will also help you during the validation process and execution phase. By learning now, you are preparing yourself to the fullest for your entrepreneurial journey later. Even if you are still working for someone right now, or in school, having this mindset will give you the tools to excel in whatever you do, so don’t ignore this if you have not begun your entrepreneurial journey. Lastly, when it comes time to execution, you can go full force and not have to worry about learning an entrepreneurial mindset, as well as all the details of your new business. 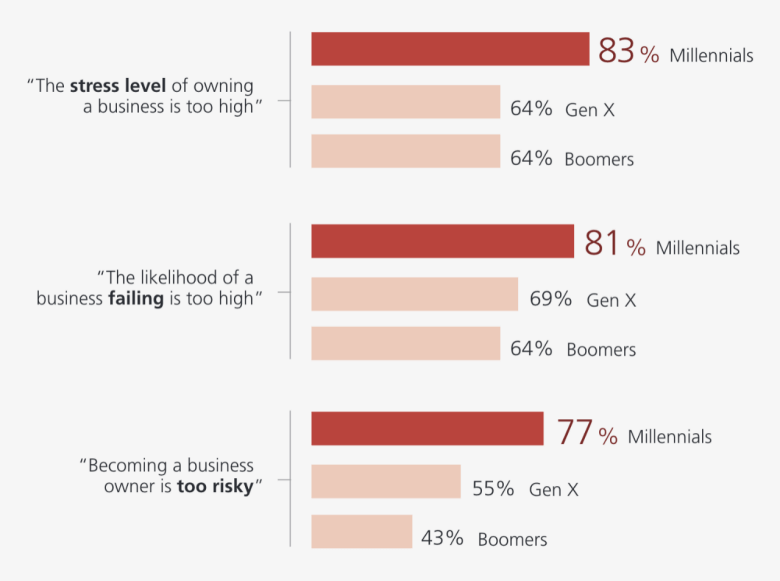 There are a few general characteristics of an entrepreneur, identified from this study, that you should know as it will give you stronger insight to why the entrepreneurial mindset is important, as well as how you can develop this mindset quickly. 1. Intensely seek new opportunities. 2. Go after opportunities with extreme discipline. 3. Go after the very best opportunities and avoid exhausting themselves and their organizations by pursuing every idea. 4. Intensely executes with agility. 5. Take account and utilize all their resources they have access to. What makes up the entrepreneurial mindset (how you can develop it). There are a few large aspects that make up the entrepreneurial mindset which includes resourcefulness, thinking different mentality, perseverance, and agility. I am going to explain each aspect, break-it down, and give you a tool or exercise to start developing that piece of the mindset. When starting to develop an entrepreneurial mindset, the first shift you are going to have to make relates to becoming a more resourceful person. This means, one is able to collect the items and information to execute on your business idea or the task in front of you. In the long run, being resourceful as an entrepreneur can take you a long way. Especially if you want to start a large-scale business idea. A perfect example of this is the chart below. 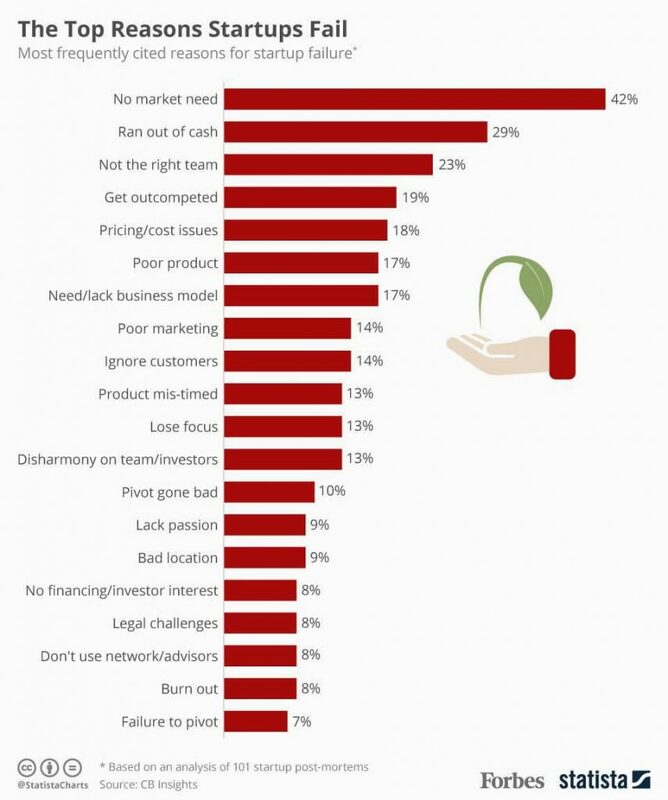 You can obviously see that new businesses and startups fail because people are using up their capital too quickly or having the lack of funds and team (actually lacking a resourcefulness mindset). For context, here is an example. If a piece of my business idea involved complex coding, I may need to learn that skill or find someone in my network that can help me with that issue. To get into the mindset of being resourceful, you’ll have to be open to trying new things and to explore all of the options that are available to you. As an actionable step, get in touch with the entrepreneurial and business centres in your area. Go to meetup.com or use the Shapr App to meet new people that you can help. They may be able to help you down the road in return. A thinking different mentality will help you in ways you can’t imagine if you want to think of a business idea that is new, creative, and has the potential to develop new markets. This mindset shift is not easy to do without context and tools, which is why I developed some exercises and tools to help you discover new ways to think of business ideas. One of the best creative processes I have found and tweaked for business ideas is the Random Associations exercise. It is a great way to start thinking outside the box and it can be done under 10 minutes. Grab two objects that are close to you. They can be anything, from a pen to a hair elastic. With each object separately, think of as many uses as you can that are outside the usual scenarios when these objects would be used. This is where you can get creative. Grabbed a pen? Maybe that could turn into a straw or a mini telescope. It can be anything you think it could be. Record all your thoughts on a piece of paper for each object. Combine your observations to see if you could think of a business idea from those random objects. Every time you do this exercise, you’ll be thinking differently every time! Perseverance is a mindset, not a trait. Some people think it is a trait, but anyone can learn how to persevere. Being perseverant means putting your nose to the grindstone when times are tough. For example, this could be pivoting when things don’t originally work out instead of giving up and trying something else. This is a massive plague of many new entrepreneurs these days. When they begin thinking of a business idea or even get to the point of execution, if there are not immediate results, people without an entrepreneurial mindset will quit. A person with this mindset will continue to put there head down and work to get things done. This mindset alone will make the difference between a successful person and a non-successful person. It is a hard mindset to master so don’t get discouraged. There are some tools that you can use to help develop the mindset. They take a bit of time to develop results, but it will be worth it, I promise. Set some small and large goals for the week and month, with the intention that there will be a consequence for not completing. This may involve not going out on the weekend to your favourite bar if you don’t complete your goals. Sounds silly at first, but it will help you develop perseverance. And remember, the promise to yourself is only as strong as your own word, so it can be best to sometimes get a friend to hold you accountable for a reward. As the days go by, work towards your goals to the best of your abilities. 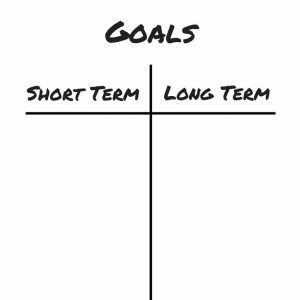 Once the deadline hits for both the weekly and monthly goals, make the assessment. If you reached your goals, reward yourself by doing or having something you love. However, if you did not achieve the goals you planned, you will not be able to enjoy those things and that is the consequence. This exercise will teach you that the goals you set out need to be completed if you want to reach success. So at the end of the exercise, assess what you can do better next time to persevere and get it completed. Maybe it is working for an extra hour, or skipping the next night out on the town. Having an agile or adaptable mindset allows you to be open to change, and make the change when needed. Agility is achieved through the openness to change. So, to be open to change there are a couple things I want you to think about. 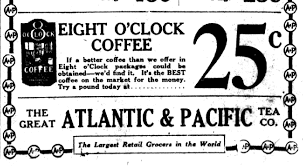 For example, let’s take a small coffee shop that has been around for years, and the owner thinks advertising in the newspaper is an effective way to get new young people to enter her cafe. After doing some research, the owner realizes that social media may be a better outlet. Instead of sticking to her old ways because she is scared of change, she switches, and the next thing you know her return on her marketing spend has increased significantly. Also, new and younger customers are coming like she wanted. Her agility allowed for this to all happen. Another aspect tied into this is acting quickly. It can be comforting to sit around and think about things forever. However, this will not get you the results you need to succeed. By acting quickly, you are able to take hold of the opportunity in front of you and execute to the fullest. Using the example above, the shop owner had an agile mindset and adapted to the new business environment. To develop an agile mind, here is an exercise you can practice. It is something you can do in your head on the bus or subway while you go to work or school. So no excuses to not develop this trait. Open up your favourite news website and look for a section related to new innovations and technology. Start by reading some articles of what new stuff is coming out. This could be new scientific breakthroughs, new developments or uses of technology. 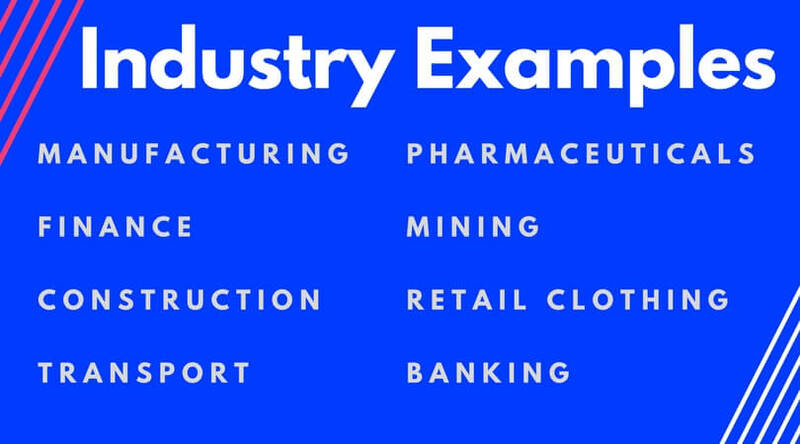 Choose an industry at random, it could be financial, industrial, food (i.e., bakeries), retail outlets. Try and apply this new innovation you found to the industry to see how it could create change. Once you start to see the awesome power of the things out there that are available to change, you will be amazed. This can be applied to yourself too. What personal habits or ways of living could you change to improve your life? Maybe it is spending less time on video games and more on developing a strong business idea. Fact – Every entrepreneur has fears, but they act on them anyway. An entrepreneurial mindset will allow you to act on your dreams, even though you are scared. Nearly every entrepreneur who has had success with their business ideas took risks, even though they were scared. Now for the tricky part, acting on those fears! Start with the top of the list, as it is the ones you are least scared of so they will be easier to overcome. It is ok to start by taking small steps in the beginning, and working up to conquering fears in a matter of a couple tries. Taking this approach is the least intimidating and can actually bring you results, to the point where you are not scared to face your fears. Who knows, you may even come to like it as you grow as a person. Can you really change your mindset? Yes, but it requires practice so that it becomes a habit. There is no doubt that these aspects of the entrepreneurial mindset will be important for your success. Every entrepreneur I have met and learned from has developed these mindsets. Some had it before they started their business and others didn’t, but they all had one thing in common and they possessed an entrepreneurial mindset. If you practice with these mindset tools and exercises regularly, then you will have an entrepreneurial mindset in no time. Found this useful? Give it a share to help a friend. Awesome! 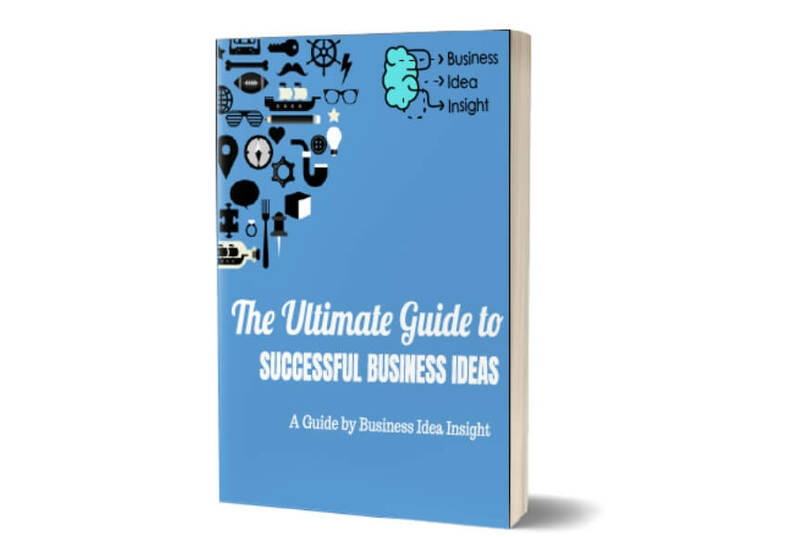 Don’t forget to check out the resources section on Business Idea Insight, where we have additional resources to help with your mindset. Love this, thank you so much. It is going to help me on my entrepreneurial journey! Thanks Neil. Let me know if there are other things you want to read about here on Business Idea Insight. This is going to help with my mindset so much! Thank you!